What better way to celebrate Samhain and Halloween this year than with these Honor Your Ancestors Picture Frames? This kit was created to accompany my upcoming bonus crafting class, exclusively for Gem Wise members, which launches on October 19. Are you excited to get crafty this season and create something beautiful for your altar? I know I am! If you’re not already part of Gem Wise, click here to join and learn about crystals, be part of an amazing community, and get in on special offers and bonus classes like this one. 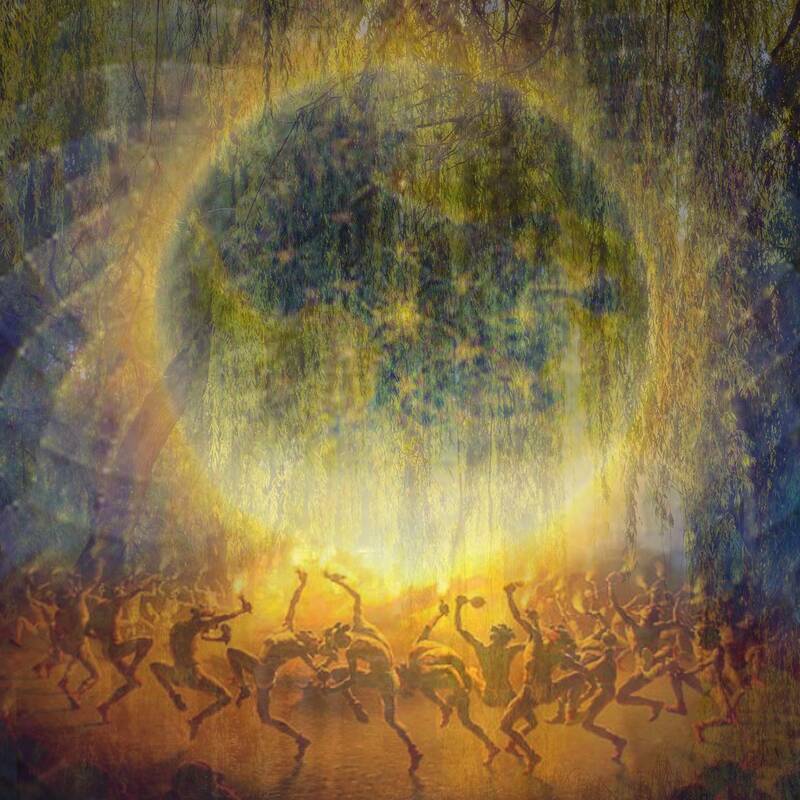 The holidays are the perfect time for crafting and I am too thrilled to offer bonus classes for my AroMagic, Gem Wise, and Holistic Healer groups that will allow us to connect and create while honoring the memory of our loved ones who have transitioned on. 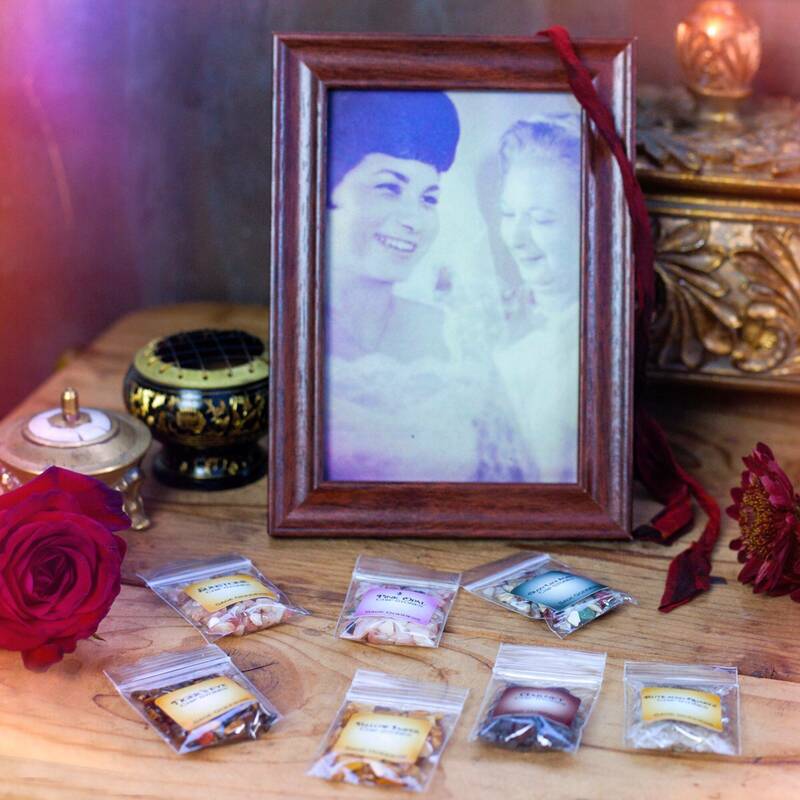 These Honor Your Ancestors Picture Frames are 4×6” wooden photo frames and each comes with chip stones and sari silk associated with the quality you admire and want to honor about your ancestor — strength, confidence, or compassion. Let’s keep the memory of our loved ones alive and in color with these Honor Your Ancestors Picture Frames. Full details on the class will be coming soon so stay tuned! 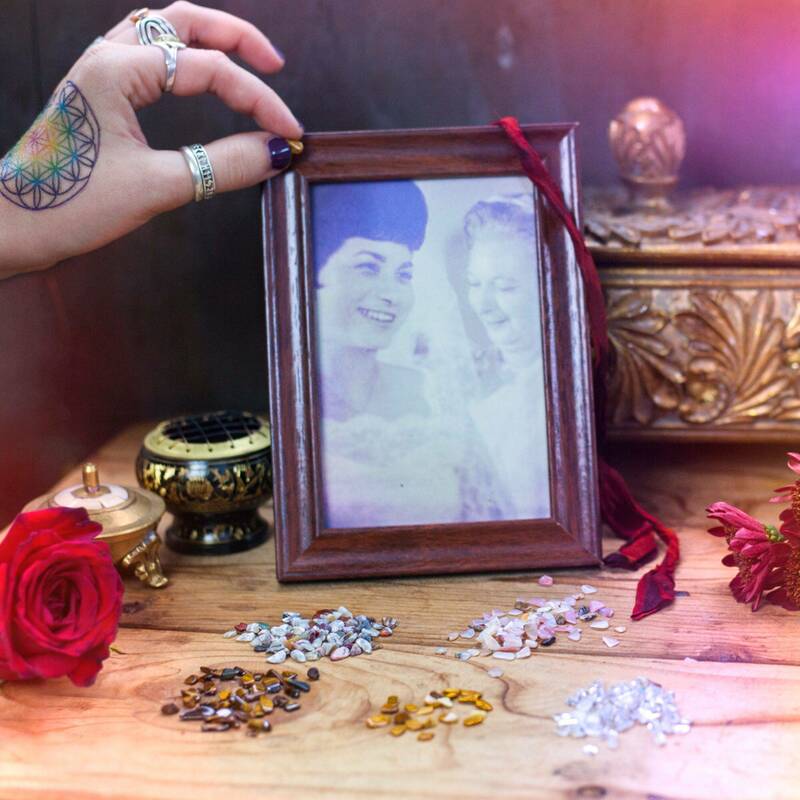 Framing and setting the pictures of our loved ones on our altars and other sacred spaces throughout our living and creative environments is an excellent way to keep our ancestors alive. Use this offering to craft with me during our crafting class or in the company of your solitude — to make a frame that captures the quality of your loved one you admire most. There are three qualities you can choose from to personalize your frame: strength, confidence, and compassion. Each option comes with and chip stones and sari silk that you can use to decorate your picture frame. Strength. With Strength, you will receive garnet, tiger’s eye, and crazy lace agate. Garnet is both a protective and calming stone. 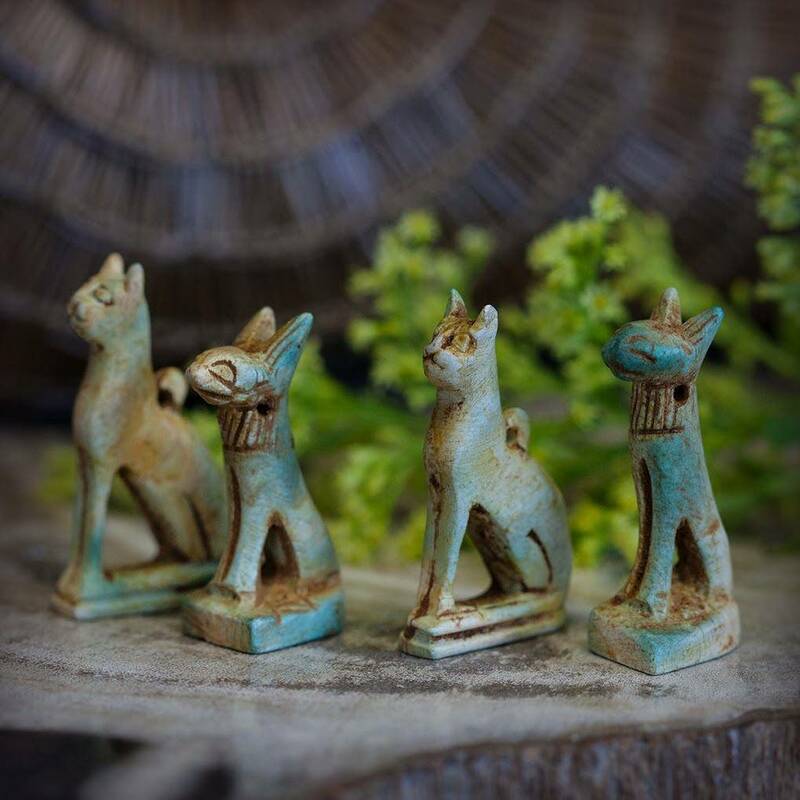 This stone will connect you to your body, as it activates and strengthens your Root Chakra, bringing about overall wellness and vitality in the process. Known as the Counsel Stone, tiger’s eye brings wisdom, courage, protection, discernment and the ability to see ahead. Tiger’s eye serves as a companion in difficult situations and as a guide when tough choices need to be made. Crazy lace agate is a happy stone with an energizing and soothing vibration. It is known as the laughter stone, or Happy Lace. It helps you stay present in the moment while also feeling safe, secure, and well. Confidence. With Confidence, you will receive yellow jasper, rutilated quartz, and sunstone. Yellow jasper creates a sense of stability and gives you a feeling of being “enough.” It is a stone that amplifies personal power and courage, renewing energy as you need. Rutilated quartz is a transformation stone. It can draw change to your environment, change to yourself, and change to your relationships. It attracts and reflects change and can help you handle the transformation with grace and calm. A stone of leadership, organization, and creativity, sunstone is a beautiful, gentle, yet powerful gem that aids you in showing up in all of your glory, power, and creativity. Compassion. With Compassion, you will receive rhodochrosite, pink opal, and rose quartz. Rhodochrosite brings compassion and self-love, helping you to be gentle with yourself as you emerge from heartbreak or loss. It helps you to get in touch with your inner child, reminding you that you are a free, loving being with infinite capacity to grow and learn. Pink opal heals the heart and also opens the heart to love. It brings you depth, perspective, and connection to your feelings. The universal stone of love, rose quartz fosters empathy, reconciliation, and forgiveness of others and more importantly, of self. It gently yet potently clears out anger, jealousy, and resentments, and creates the space where healing of such emotions can take place. This listing is for one (1) Honor Your Ancestors Picture Frame (4×6” in size). I have three qualities you can choose from to personalize your frame: strength, confidence, and compassion. Please choose from the drop-down menu the quality that calls to you. 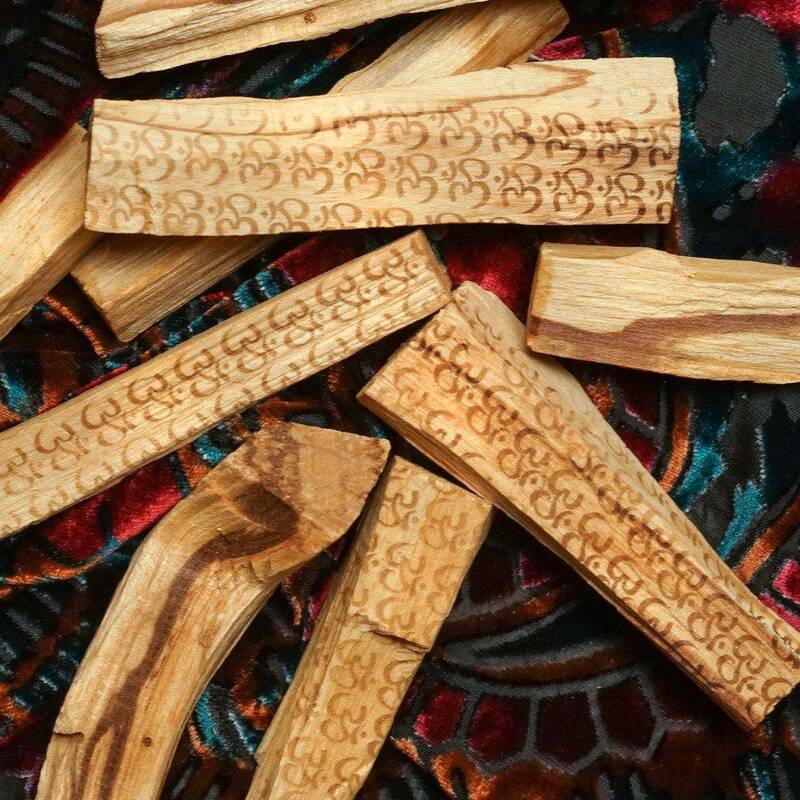 Yours will arrive lovingly parceled along with a single leaf of white sage and a parchment describing the properties of the stones.